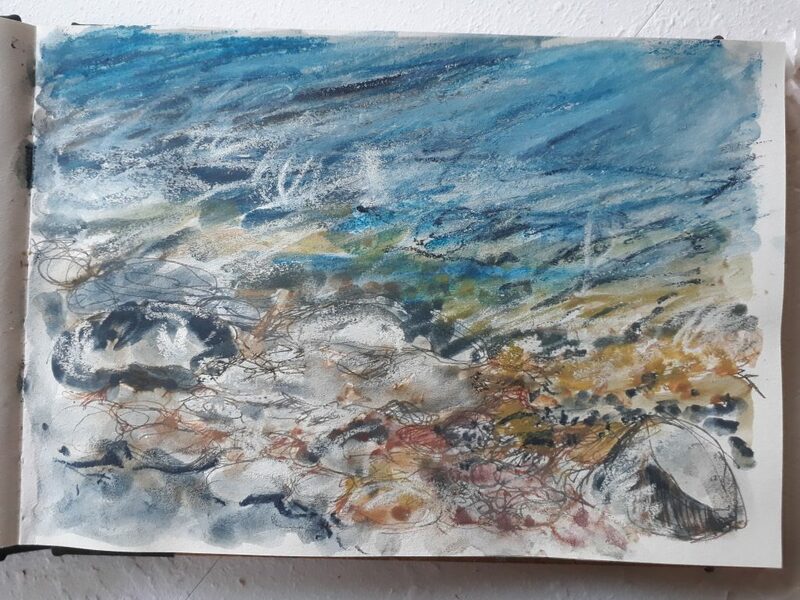 Living as I do in Oxfordshire, I value my time on the coast which gives me the perfect opportunity to sketch and study one of my passions: the sea. I take a sketchbook, some drawing pens and a selection of Derwent Inktense pencils and Inktense blocks, and a piece of resist wax – with these I explore what can be achieved with a limited kit. I generally work in a small sketchbook, making quick expressive marks with a pen and sepia ink pencil and fixing with a spray of water to establish the drawing. I then work up layers using a wet brush by picking up the colour from the surface of the pencil or block, which dry quickly allowing easy build-up of colour. The wet block can also be used to add strong touches and marks. With a dry block, texture can be added and fixed with a spray of water on top. I really like the painterly effects I achieve with these techniques – which are similar to the way I work with acrylic paints in my mixed media textile pieces where I combine layers of paper fabric colour and stitch. 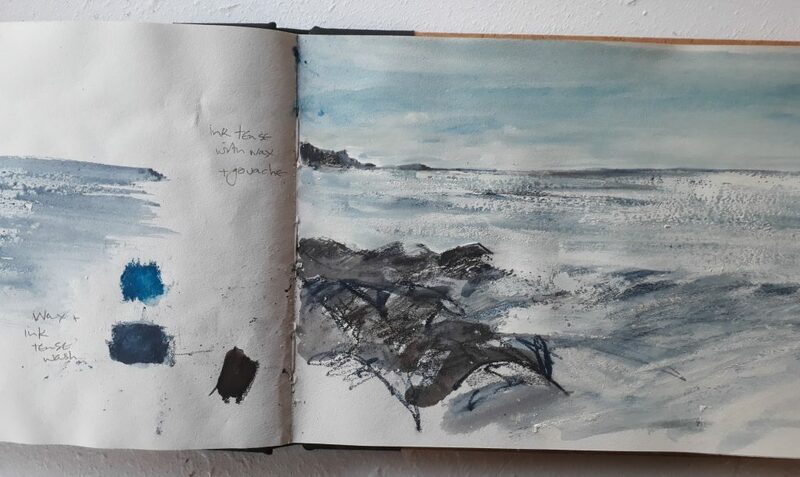 I tried working a limited mini palette on the page of my sketchbook, which resolves the difficulty of identification of colours as several of the darker shades are visually similar, requiring a small test on paper to make sure the right shade is selected; for example, Paynes Grey is easily confused with charcoal grey and Chinese ink. This also helps focus on a colour palette and is useful for quick colour notes. I also have little broken pieces of the blocks in my box. To use up the small pieces and crumbled bits, I experimented with grinding them down further to a powder using fingers or a small pebble on a rough surface – or even a shell found on the beach. Sprinkling this onto parts of my drawing gave a pleasing textural effect. Spraying the pigment with water then fixes it on the paper and, finally, I used white in this way to create sea spray and foam. 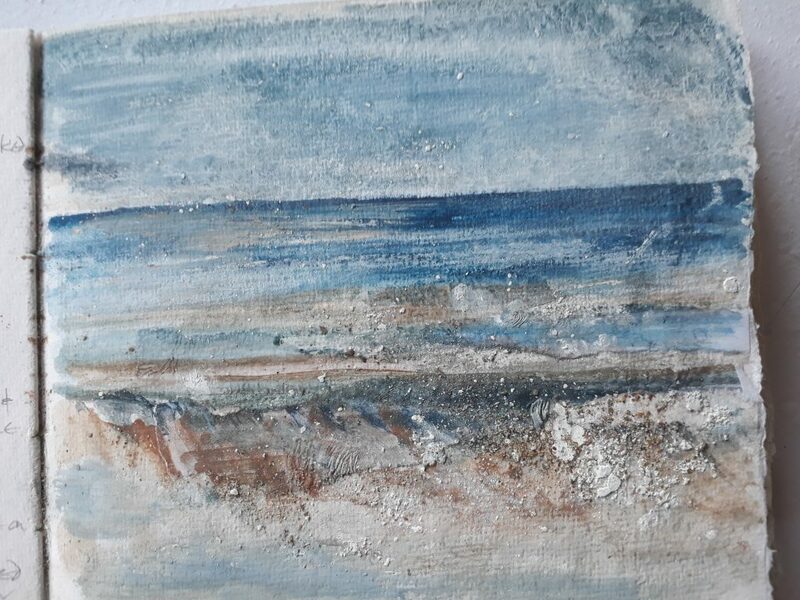 This effect also works well with a little PVA glue mixed in, with the potential to add in sand or fine soil found on the shoreline; I also bought a small tube of gouache from a supermarket, which proved a good addition to my kit along with my piece of candle wax for resist wash work.